This breathtakingly exciting book discovers the Irish language as you've never learned it before! Fatti Burke's amazing illustrations and her father John's fabulous teaching bring the language alive with every turn of the page. A visual introduction to Ireland's language for young and old, you will learn your first thousand words, discover your culture and enjoy the fabulous quirks and features of your native tongue! Bringing a contemporary appeal to a classic subject, get ready to fall in love with your language. It's Irish as you've never seen it before! 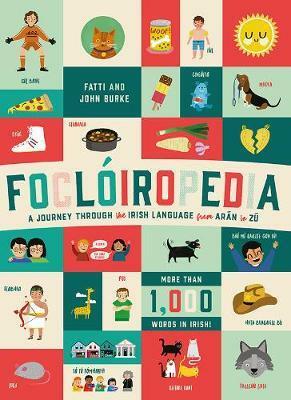 This is the third book from the bestselling father and daughter duo behind Irelandopedia and Historopedia, which have sold over 100,000 copies. Kathi 'Fatti' Burke is a Dublin-based illustrator. Her first book, Irelandopedia, won The Ryan Tubridy Show Listeners' Choice Award at the Irish Book Awards 2015 and Historopedia was nominated for the Specsavers Children's Book of the Year (Junior) Award in 2016. She lives in Dublin. Her favourite word in Irish is laimhini. John Burke is Fatti's dad. He is a retired primary school teacher and was Teaching Principal of Passage East National School from 1980 to 2009. He has taught all age groups during his career, but focused most of his teaching on the older classes. He lives in Waterford. His favourite word in Irish is sceitimini.